Want to be notified of new releases in esl/ex_rabbit_pool? Store the channel pool to the connection workers state (we can move this later to ets). Queue and dequeue channels from the pool in order to make them accessible to one client at a time reducing the potential for race conditions. We support setting up queues when starting up the supervision tree via ExRabbitPool.Worker.SetupQueue, right now it doesn't handle reconnect logic for you, so if you have a reconnection and you are working with auto_delete: true queues, you need to handle this case by your self (re-create those queues because if connectivity drops, auto_delete: true queues are going to be de deleted automatically and if you try to use one of them you would have an error as the queue no longer exist). 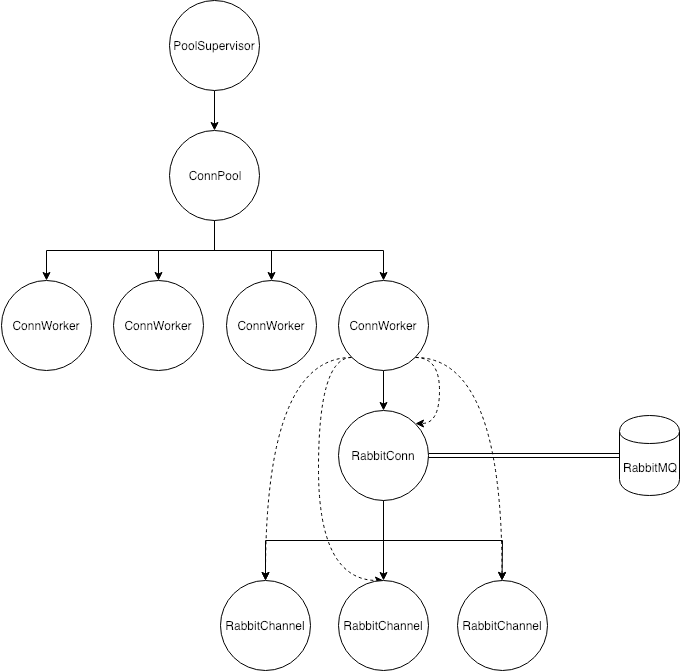 In the examples directory you are going to find an implementation of a RabbitMQ consumer using the library, all you need to do is, starting RabbitMQ with docker, and copy/paste the following code into the iex console. What it does is, setup the connection pool, setup the queues, exchanges and bindings to use, start the consumer and finally publish some messages to the exchange so the consumer can echo it.